Firstly. Obviously I have survived the first few days of school. Hooray! Much rejoicing. Thank you so much to everyone for their kind words. My son is settling in beautifully after homeschooling, and my daughter is just loving Kindy. Whew. In an attempt to consume less chocolate and junk, I decided to try to sew my feelings instead of eat them. Not as much sewing happened as I would have liked. But designing happened. And that's just as good. I didn't plan on new Star Wars patterns. It kind of just... happened. See here's how it came about. A post came up on IG about a Star Wars swap - appropriately entitled "May the Fourth Be With you" with posting dates for... you guessed it... May 4th. (Btw if you're interested, I believe there are still spaces available - sign up via the link in @justjoshinkids profile. Of course I had to sign up for this. It's like I had no choice. Jedi mind tricks. Obviously. 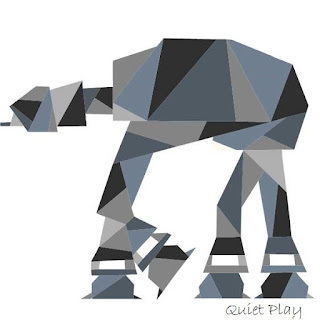 Then... Jennifer (@downstairsdesigns) suggested a geometric AT AT. Well. Challenge accepted, my friends. And then I couldn't just stop there. How about a Millenium Falcon? Or a Tie Fighter? 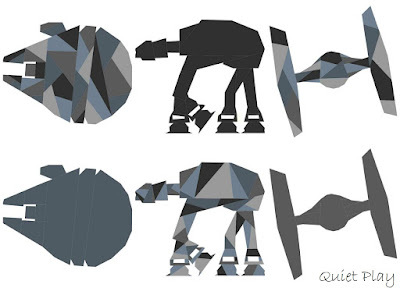 Oh but the dilemma.. do I prefer the silhouette version or the geometric version? In the end... I've decided to hell with it - let's have all 6 patterns. Well pattern designing definitely counts as sewing to me! Busy you have been, well you have done (hehehe)! Awesome!! Looking forward to these. I love them all--looking forward to this wonderful gift!!! These are fabulous! I can see a potential anniversary present here! Fantastic - thanks for sharing them! They're amazing Kristy! I'm still plugging away at my original (i.e. yours! )Star Wars quilt. Obi Wan is now finished (except for his face) and I think I'll do two more blocks before calling it done! My grown son would love these. He graduated college on May 4th, and loved saying 'May the 4th be with you' to everyone. Awesome patterns! I signed up for this swap and I am very excited about it!